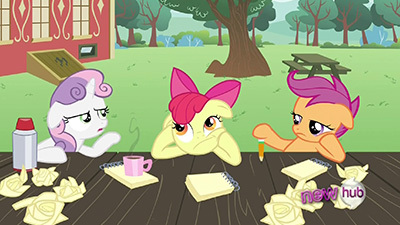 The Cutie Mark Crusaders try their hooves at writing for the school newspaper in hopes of discovering their latent talents for journalism (spoiler alert: they’re still blank flanks). But when the paper’s new leadership demands frivolous gossip over “boring news and stuff,” the girls find themselves doing more harm to the town and their own reputations than they realize. Any time one of the CMCs claims to have “the answer to all our problems,” you just know things can’t possibly end well. That said, the newspaper was actually a pretty good idea, or at least one that shouldn’t get them covered in tree sap by the end. Leave it to Sweetie and Scoots to royally screw it up anyway. So anyway, the CMCs decide to try working for the school newspaper as a way to find their cutie marks. No sooner do they join do they learn that the new editor in chief is none other than the douchebag queen herself, Diamond Tiara. How she managed to work her way up to that position I will never know. The girls make a grave tactical error by thinking that they can “take a little bit of Diamond Tiara for a lifetime of cutie marks” and get hard at work on their first stories: a nest of baby birds, Rarity’s hot new hat, and an early history of Ponyville. To the surprise of absolutely none of the viewers, Diamond Tiara thinks all these stories are absolute garbage and demands the girls get out and find the juiciest drivel possible. Trust me, I didn’t include this screenshot because I wanted to ogle Snips and Snails’s butts. Rather, I wanted to focus on their cutie marks, or more precisely, the lack thereof. I don’t think there is ever any detailed explanation of exactly how a cutie mark manifests itself on the body, so it’s unclear whether it more closely resembles an airbrushing on the coat, a complete change in hair color, or something that goes down all the way to the level of the skin like tiger stripes. Okay, yes, there’s magic involved so D) None of the Above is probably the correct answer, but let’s pretend that’s not an option this time. This scene would seem to indicate that cutie marks are essentially changes in hair color that just grow back if the hair is shaved off, and that popony seems particularly distraught at the sight of S&S’s blank flanks leads me to believe they all know that the defamation is only temporary. Nonetheless, as someone who has read many a fanfic whereby cutie marks are defaced, destroyed, or otherwise altered, I have some morbid curiosity about whether there are any non-magical dangers that the ponies would need to be wary of lest they damage their marks. Of course, whether this scene was ever intended to be a canon description of cutie mark makeup is certainly debatable; I’m guessing it wasn’t, since it’s really a joke scene, and why I’m dwelling on a pair of hairless rears is beyond me so I’m going to get back to the episode now thanks. 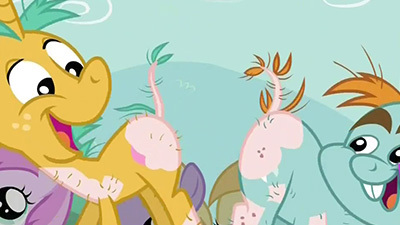 Apparently, though, everypony is more interested in a pair of hairless rears than “just boring news and stuff,” so despite my best efforts I managed to focus on something relevant to the episode’s plot (no pun intended). The CMCs jump on S&S’s misfortune and write an airheaded article about the whole ordeal, and Diamond Tiara absolutely drinks it up. Their pen name, Gabby Gums, even earns them an offhoofed compliment from the douchebag queen; shocking! The wild popularity of this story sends the CMCs out writing gossipy stories about other ponies in town, something that Twilight finds disturbing but everypony else seems to enjoy. The awkwardness that the stories cause lead the CMCs to try and “sneak in” a less gossipy biography of Spike, but Diamond Tiara thinks it’s horseapples and doubles down on her demand on juicy stories. Thus, in an effort to “give the ponies what they want,” the CMCs start making up all sorts of nonsense on everypony, even including the Mane Six: Applejack is lazy, Twilight is a snob, Fluttershy uses mane extensions, Pinkie Pie is an out-of-control party animal, Rainbow Dash is a softie, and Rarity is a drama queen. Sure, some of those stories may have contained a kernel of truth or two, but they way they were presented was absolutely bonkers. These stories really rub the Mane Six the wrong way, though Rarity continues to shrug it all off as a bit of harmless fun… until it directly impacted her, then it was the worst. Possible. THING. Rarity then discovers that the CMCs are Gabby Gums; once the word spreads, “pariah” doesn’t even come close to describing what the CMCs very quickly became. But the worst is still to come. When the CMCs decide to quit the Foal Free Press, Diamond Tiara reveals that she had been secretly collecting scandalous pictures of them and would have them printed in the next edition of the paper if the trio decided to stop writing as Gabby Gums. Now not only are their friendships in shambles, but whatever scrap of reputation they have remaining is being blackmailed. And that’s why one should never make a deal with the devil. The CMCs’ solution to this mess was actually pretty clever: they still wrote a piece as Gabby Gums (so Diamond Tiara would run it), but it was one where they came clean and apologized for their misdeeds. I’m glad that their apology was accepted by their friends so readily and completely, though that being said I do think the harsh treatment they had received previously was also entirely justified. Good friends will forgive you when you screw up, but they should also let you know in no uncertain terms when you’re being a jerk. In all, this was a pretty solid episode but not a particularly memorable one for me. Nothing really stuck out as completely egregious (even Diamond Tiara wasn’t quite as atrocious as she usually is), but at the same time nothing stuck out as particularly noteworthy, either. I enjoy it, but there are plenty of other episodes I’d much rather watch again. It seems I’m not the only one who didn’t find anything especially inspiring about the episode, either, as I can’t think of any brony songs off the top of my head that link back to this episode. So instead, have The Equestria Daily Song by MandoPony, which just happened to be playing in the background while I was typing up this deconstruction and is pretty fun. A blog is like a newspaper, right? Actually I was listening to the karaoke version without lyrics, but the with-lyrics version is pretty good too! Is… is this Mean Girls? Ah ha ha this is almost Mean Girls. Diamond Tiara is doing her best impression of J. Jonah Jameson (“Get me pictures of Spider-Man!”) demanding libelous articles of dubious newsworthiness. Getting the newspapers out and in the hands of readers is given a significantly higher priority than the quality of the writing. For a school paper, that makes some sense. Children writers aren’t exactly good at accurate reporting, or citations, or sources other than Wikipedia. Editor-in-Chief Diamond Tiara violates journalistic ethics by publishing articles that are more popular than they are truthful. …aw, this is literally about ethics in journalism. Great. I’m going back to the Mean Girls reference because I like that better. The Crusaders stick with journalism far longer than they stick with most of the things they try for their cutie marks. It’s fun at first, but the gossip-mongering strikes a poor chord when it becomes hurtful, and the girls try to get out. Diamond Tiara has her own Gabby Gums-style article ready to go about them, and the hurtful gossip comes home to roost. This is totally not Mean Girls. You should watch Mean Girls anyway. OH OH OH and then there should be an episode that REALLY IS Mean Girls and it’ll be great because that’s a great movie that manages to have a great lesson about being who you are and not ingratiating yourself with people because you like how popular they are and turning yourself into someone you don’t like and I’ve gone completely off-topic. Despite Fluttershy’s brief appearances in this episode, it’s going to be one of my favorites. This may have something to do with how vocal Big Macintosh is defending Applejack. I love how they swap vocal mannerisms. They’re totally siblings. Based on Snips, Snails, Diamond Tiara, and now Featherweight, I’m guessing that Appleblossom’s cutie mark will be a flower on an apple tree, Sweetie Belle’s will be some kind of hand bell, and Scootaloo’s will be… a… scotcharoo. At the rate they’re going, they’ll all get some stylized representation of an apology. …how is Featherweight holding that camera? And how did he get a picture of Celestia scarfing cake? And how did he not get a camera cutie mark with those mad skills? I especially love that he got a photo of Diamond Tiara blackmailing the Crusaders. I super duper like how the final Gabby Gums article acts as the episode’s letter to Princess Celestia. Given that she was featured in an early article, I can almost guarantee that she read it. I really like this episode, and while it’s not quite in the running for “best” CMC episode (what with episodes like Show Stoppers before it and ones like Flight to the Finish coming in the future), it’s still definitely within the better half of them. I love the dilemma set up here : it’s only natural that through the course of trying EVERYTHING for their cutie marks, the CMC would eventually start turning from the more random tasks to more feasible career-focused ideas, and the school paper is a fitting outlet for them to try their hooves at something (which is sort of the point of a student-run school paper anyways). Cheerilee takes a total “hooves-off” approach to the whole thing, allowing the editor to pretty much have run of how the paper is handled. Which is great, if you have a competent and right-minded editor at the helm of things… significantly less so if you have Diamond Tiara running the show. The timing on the CMC’s part for getting involved with the paper is catastrophically bad, as the former editor (apparently named Namby Pamby, making for a fun wordplay gag that really only works because a name like that isn’t out of place) has just retired and somehow Cheerilee came to the conclusion that Diamond was a fitting replacement. DT immediately sets out to convert the Foal Free Press from pseudo-informative local news into a gossip rag. What follows is not only a lesson on gossiping and respecting privacy in general, but also a bit of commentary on journalistic integrity and consumer media… because say what you want about her, but to her credit, Diamond Tiara’s idea for the paper is a massive success. The CMC’s creation of Gabby Gums turns the paper from what appears to have been considered a slightly average school paper into something Ponyville newsstands actually wanted to carry alongside the actual local newspaper. The whole thing starts to seriously complicate the question – what do you do if you know what you’re doing is wrong, but that wrong thing is actually selling and the thing that’s causing you to succeed? Of course, it gets a bit simplified by the end by things going too far. Gabby Gums as a column snowballs from highlighting somewhat embarrassing schoolground antics (that, to be fair, the subjects of don’t seem terribly bothered by being the center of attention whatever the reason for it), to digging up whatever dirt they can on the town as a whole and spinning it, to just outright fabricating gossip stories about ponies whole cloth. The town slowly goes from eating up the stories to eventually turning on the columnist, their minds likely changing as soon as they become the subject of the section. Which is, of course, a bit hypocritical, and Rarity embodies that angle in full, as she’s clearly the most enthusiastic consumer of the gossip stories, and also has one of the biggest knee-jerk reactions of hostility as soon as Gabby Gums sets her sights on her. Which, ironically, acts as the CMC’s major blunder in so far as keeping their identity secret – Sweetie Belle has access to Rarity’s diary, and it doesn’t take Rarity terribly long to uncover the evidence of who was behind things. Rarity’s lecture towards Sweetie Belle that follows feels a bit empty, as it’s clearly of the “do as I say not as I do” variety (Rarity in general doesn’t come out looking too great this episode, but it both doesn’t feel terribly out of character for her, and her over-dramatic hypocrisy is at least written rather hilariously). The three becoming social pariahs following being uncovered makes total sense, even if by and large the ponies shunning them were eating up her stories when they weren’t about them – but as soon as you know who the person coming up with those stories is, it makes sense that you’d avoid them outright. It’s a situation in which it’s clear that the CMC are deserving of what they’re getting, and yet it’s also hard not to feel sympathy for them – after all, they did put forward a genuine effort towards moving away from the gossip-style stories, only for them to be rejected outright. And in the end, they feel a believable amount of remorse, and their open-letter apology towards Ponyville and the slow but strong forgiveness from their relatives and friends is handled well. And Cheerilee finally steps in and unseats Diamond Tiara as editor now that it’s clear that the direction got out of hand, with her getting her come-uppance in the form of winding up with the “messy” job of running the ink press (although I’d imagine she probably just quit outright shortly afterwards). All in all, this is one of the more solid CMC episodes in my book. It’s fun, humorous, and actually has a rather complicated moral problem at the core of it. My only gripe in the matter would be that it’s not totally clear that all of the adults properly learned the moral along with the kids (while there’s a decent argument to be made for the others, Rarity at least is suspect for not actually learning anything). Also, this is an accurate depiction of Deconstruction Is Magic being written on a weekly basis.